I just want to scream to the world that the SaeboGlove is definitely the best product, so that every parent of a child with hemiplegia will know about it. My son Tavion suffered a grade four brain bleed at birth. As a result, he has struggled with right side hemiplegia his entire life. Over the course of his eleven years, he has become the king of doing things one-sided. It was nearly impossible to get him to use his right hand in play, at school or in daily tasks. This started to change three months ago when Tavion received a SaeboGlove. Since he began wearing the SaeboGlove I have seen marked improvements in Tavion’s ability to pick up small things, grasp objects, and in his range of movement. What is most remarkable is that these improvements are apparent whether he is wearing the SaeboGlove or not! 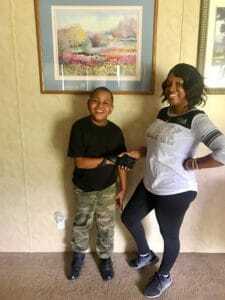 Although Tavion wears the SaeboGlove for much of the day, he is starting to incorporate his right hand in activities even when the SaeboGlove is off. These changes in the strength and flexibility of Tavion’s hand are paving the way for new levels of independence for him. This is what every mother wants for her child. The SaeboGlove has been life-changing for us. I just want to scream to the world that it is definitely the best product, so that every parent of a child with hemiplegia will know about it.